World’s Largest Golf Outing officially closed the book on the 2018 event last week, presenting a check to Fisher House Foundation at the Billy Casper Golf 30th Anniversary Celebration. The team gathered at Reunion Resort (Kissimmee, Fla.) to highlight the importance and beneficiaries of the event, now in its ninth year running. The World's Largest Golf Outing (WLGO), an annual charitable golf tournament conceived by Peter Hill, Chairman and CEO of Billy Casper Golf, brings together players from across the country to "golf for good." Since 2016, WLGO has partnered with Fisher House Foundation, a network of 82 comfort homes around the world providing free lodging for US military and veterans’ families while their loved one is receiving medical care. 2018 proved another successful edition of the event, raising a total of $345,033. The check presentation was one of many WLGO highlights at the 30th Anniversary Celebration. Those in attendance were moved as Fisher House Foundation Chief of Staff Mary Considine and special guests Craig and Toni Gross shared stories of the impact that Fisher House has on many lives. The Gross family is a Gold Star Family, as they lost their son Cpl. Frank R. Gross in 2011 while serving in Afghanistan. Their story of perseverance, commitment to service, and finding hope through Fisher House Foundation inspired the room and kicked off the 2019 WLGO season with authority. 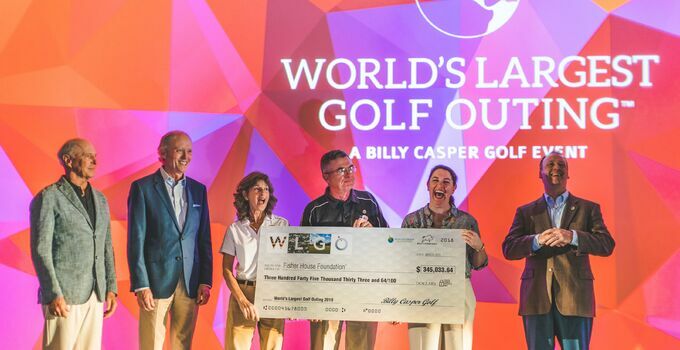 With over $4.1 million raised to date, WLGO and Billy Casper Golf hope to see 2019 secure even more donations to support Fisher House Foundation and its expansion efforts. Funds raised from the 2016 and 2017 event helped open a new Fisher House in Orlando, and funds from 2018 are in place to make even more positive change in other areas of the country. Registration for host courses is live and can be found on this page. More information is available by emailing info@worldslargestgolfouting.com. To learn more about this great cause, visit https://www.worldslargestgolfouting.com/about/fisher-house-foundation.